This amazing animatronic Pony moves head and ears, and blinks its eyes! 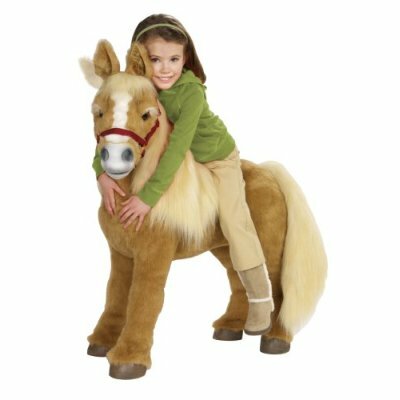 This fantastic creature responds to touch and voice, 'eats' a carrot, swishing tail, has soft fur coat and makes real pony sounds. 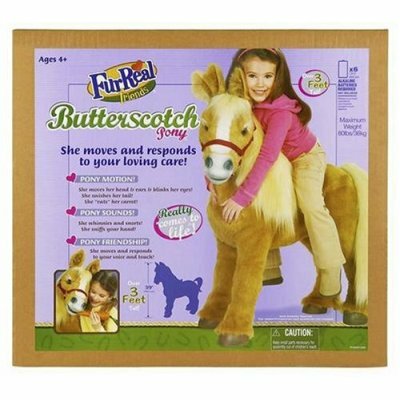 The FurReal Friends Butterscotch Pony comes with carrot and brush. Measures 20" x 39" x 42". Requires 6 'D' batteries, not included. Through sensors, Butterscotch can feel when she is being groomed and will move her head toward you, and may whinny and snort. The more you touch her, the happier she becomes. 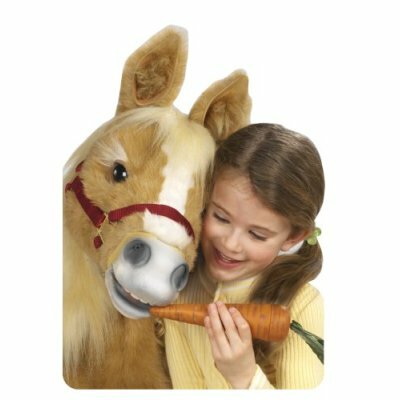 Just like a real pony, Butterscotch loves carrots and can be "fed." Hold the pretend carrot to her face, and she will open her mouth for it, or shake her head "no" if she has had enough.